Sure you can get a lot of fun exotic flavours out there, but it is so fun to make your own, and so easy too! You also skip a lot of the preservatives they put in most commercial sorbets to keep them a certain texture. The joy of customizing your own sorbet is just a whole lot of fun to me. 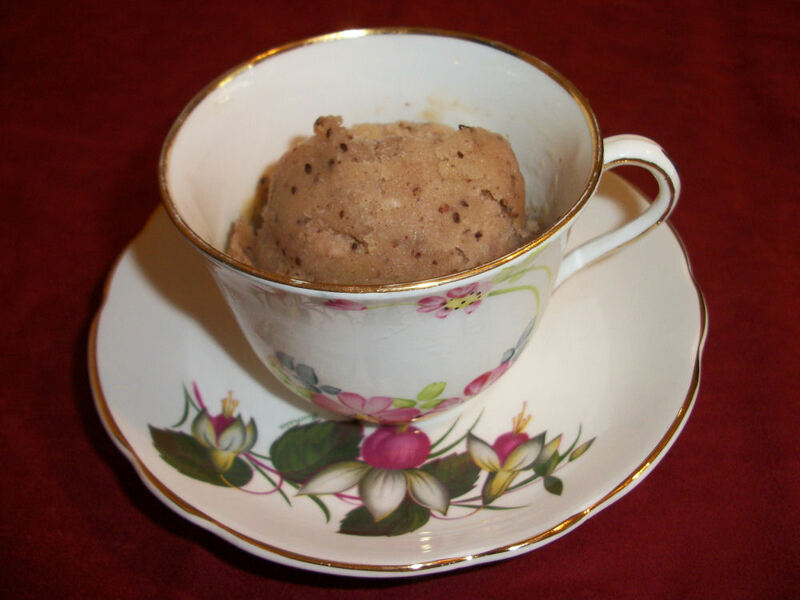 This is one of my tea based sorbets. The lovely thing about it is you are getting the healthy benefits of tea with your icy treat. You can use any fruit you like, I just happened to have a bunch of kiwi sitting around. The combinations are endless! Yes, you can make sorbet without an ice cream machine. I used to do it all the time, then we got an ice cream machine as a wedding present and have been spoiled ever since. I don’t use food colouring in my homemade sorbet, you may want to do that if you want your green tea to actually look green. Combine the water and tea in a saucepan. Bring to a boil, remove from the heat and allow to brew uncovered for 5 minutes (do not go over or your tea base will become too bitter). Strain and discard the leaves. Add sugar, bring to a boil while whisking in the sugar until all the sugar dissolves. Remove from heat and cool, approx 1 hour. Puree the fruit, lime juice and tea in a blender. After this you can either add it to your ice cream maker and follow the manufacturers directions or pour the mixture into a small glass pan. Place the mixture in the freezer. Every couple of hours break the ice on the sorbet and give it a stir. This will help it freeze up into a nice sorbet in about 8 hours, if you check it less often it will have a more granita style of texture. This makes two servings and can easily be doubled. With sugar each serving contains 207 calories, .5 grams of fat and 3.9 grams of fibre. With splenda each serving contains 70 calories, .5 grams of fat and 3.9 grams of fibre. I find it cute to serve it in a tea cup because of its tea base. This entry was posted in Dessert and tagged kiwi, sorbet, tea. Bookmark the permalink.